Stir in confectioner’s sugar. Freeze for 30 minutes. Scoop out heaping tablespoons of the cold mixture and roll into balls, using all the peanut butter mixture; place on a parchment or wax paper lined baking sheet. Freeze for 15 minutes. 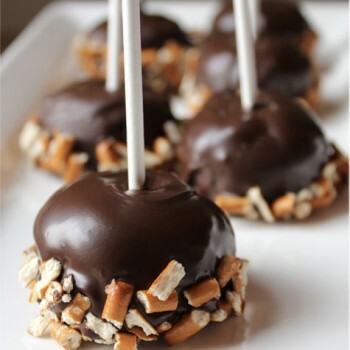 Remove from freezer and insert one lollipop stick in each peanut butter ball. Melt the chocolate, following package instructions. Dip and roll each ball in the melted chocolate and dip into the crushed pretzels; place back on prepared baking sheet. When all the peanut butter balls are finished, place baking sheet in the refrigerator for a few minutes or until the chocolate is set.